I finally did it…I went through every server I had toons on, which wasn’t many, and deleted any I knew I would never touch again. I didn’t delete any 85s, just toons below 80 that I would likely never play again. That felt good! 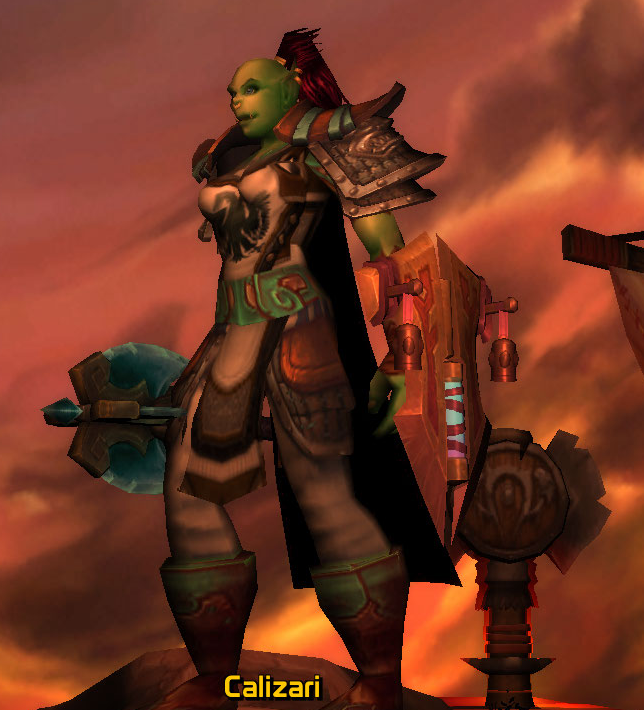 I even found an old Shaman on another server that was leveled as Enhancement! She is collecting dust but maybe I will dust her off late in the next expansion. It didn’t feel strange or anything, deleting toons…probably because I hadn’t been on any of them in a year or more. I think a Draenei Shaman has me curious because I have been Horde for so long. And after 4 years I guess I am ready to try the other side and see what its like. But not just yet. After being on Prednisone for a week and a half, today I feel like crap again. It has made me slow down and realize that this is not going to be a quick recovery. And I need to not over do it. Easy to say, hard to do. So what else can I do to keep busy? I have been pondering that for a few days…and I think that its time to put a more serious effort into my blog. That alone should use up quite a bit of time. With MoP coming up, I could stream a day of randoms or just Fraps a few things to see how I like it. I am not really good at trying to tell folks how to play or help with their healing, there are plenty of other sites that do that without literally holding ones hand…but videos might be an idea. I just don’t know if I want to do all the editing that many do on theirs. Streaming is an idea…but I don’t want to go all out on that either. So maybe a little of both?…and see how it goes? Also posting on regular intervals is much needed, although much of that depends on how I feel from day to day. With just two weeks until MoP drops, that gives me a decent amount of time to get things planned out a little, while getting more done on Ezdenia and Trivenna in that time. 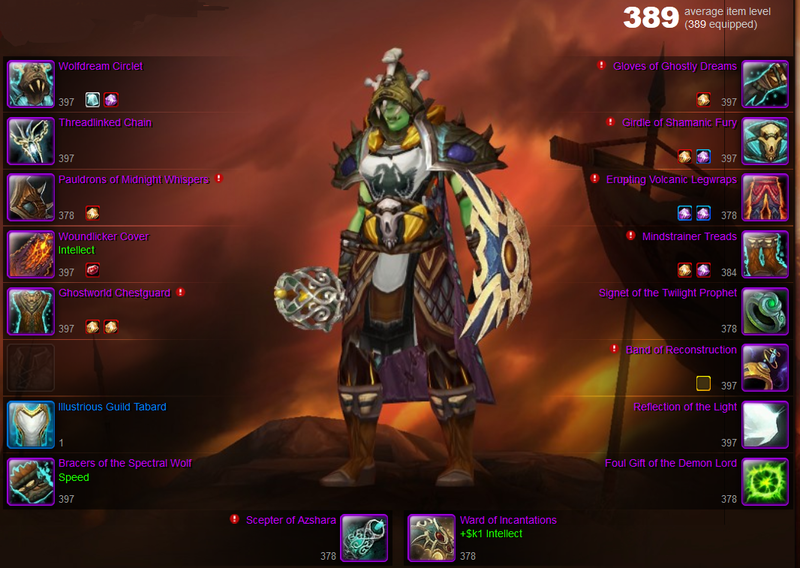 Ezdenia is level 76 today and I set up the UI for Trivenna last night before bed. So now its a matter of nose to the grindstone and I will have these three gals ready to do what is needed of them in the new expansion. If I level a Panda-something, it won’t be for quite a while. So…I need to get Ezdenia that last 9 levels and have her Enchanting/Tailoring maxed out and then get busy on Trivenna…and have it all done by the night before launch…hopefully. Oh, and do the Theramore event on Calizari. Am I trying to do too much? I don’t know…probably. 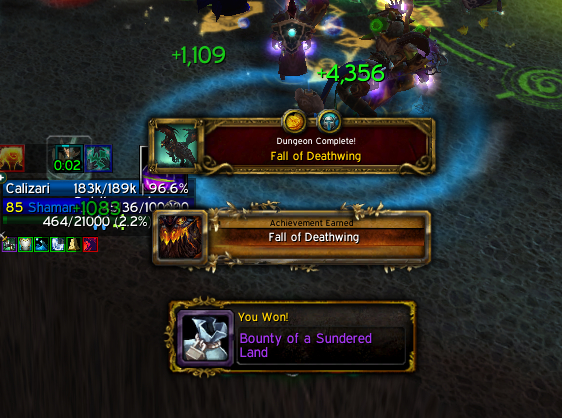 Leveling is so easy now, even without Heirlooms. I just want to stay busy and be as close as possible to having the professions I need ready to help Calizari not have to buy gems, flasks, bags or Enchants and at the same time be able to sell extras on the AH and save up a pile of gold. If I get it done before launch…then maybe I can take a day or two off and finish reading First King of Shannara by Terry Brooks. I really love the Shannara series. And getting away from the computer for a couple days would probably be a good thing. Now if I could actually do it. I am better now that the Prednisone is working…the morning after starting it, I woke up to MUCH less pain than I had the night before which shocked me and made me jump up out of bed. When I put both feet on the floor and realized that I didn’t have rocks in my feet I was ecstatic! What an improvement! I am trying not to get my hopes up, but not being in so much pain everyday is a start. So now I am trying not to over do it because I have some of my energy back, and the swelling in hands and feet has started going down but hasn’t gone down as much as I had hoped by now…not sure if it has something to do with the dosage or not. I guess I will see in a couple days what doc has to say about it. I have managed to get Calizari’s Jewelcrafting, Mining, Fishing and Cooking maxed out and ready for Mists. I really like playing Shaman…maybe it just took me a while to overcome the whole totems management thing, but I love the insta Ghost Wolf and who wouldn’t love peeling yourself off the floor when it’s needed once in a while? I will take that over a Battle Rez any day. 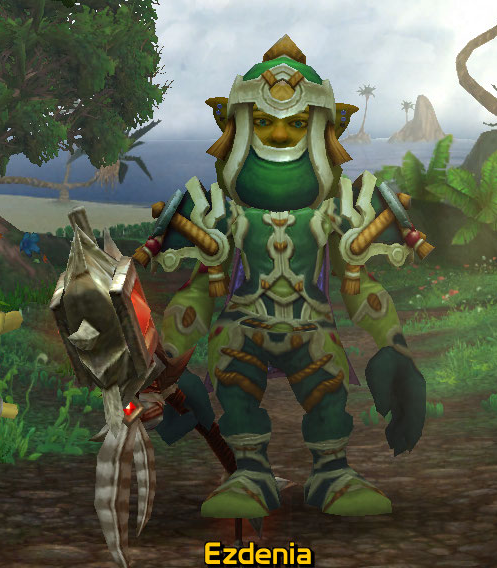 And I have always thought that Shaman had the most awesome looking gear in the game. Now to wait around for the xpac. Three weeks to go! In the mean time I have to get Ezdenia leveled up and get her professions maxxed. After that, I have no idea what to do til Mists. During the day I am often the only one on in my guild. And things are going to be getting a little busier for me during the evenings now that the school year has started again. So I am going to look for a second server for daytime playing. 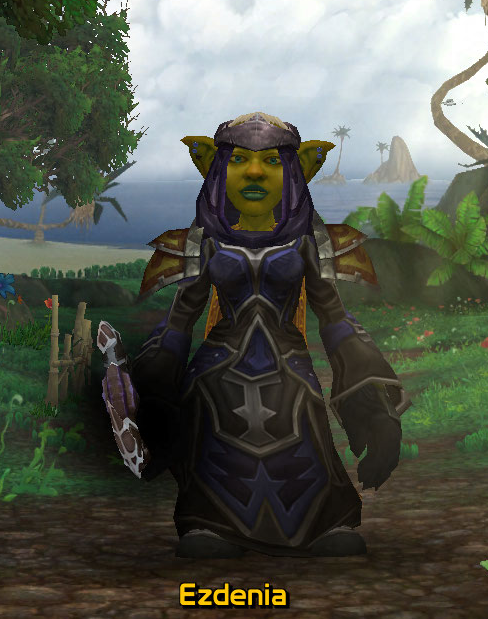 Since the Draenei curiosity has to be dealt with, a new shaman will obviously be Alliance. Since being on the Prednisone and feeling better other than a couple side effects, I took a look at the toons I have created and not leveled and have been wondering what to do with them. 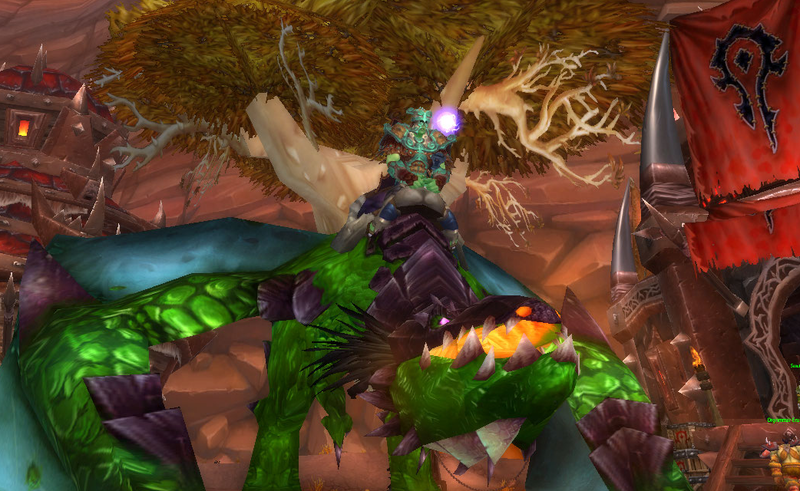 Now, I really like my Shaman and would like to be at my best by the time Raids open up in Mists. Checking out a few of the High pop servers to see what I can find and then get busy leveling a Shaman there as well. I have three weeks ya know! Not much else for me to do other than sit and wait for eggs to hatch out a Green Proto…like I would get that lucky. Servers are back up after the restart, so off I go again.